Der BT-7 Artillerie ist ein sowjetischer premium leichter Panzer der Stufe 3. Zwischen 1934 und 1935 entwickelte das Entwicklungsbüro der Karkhiw-Lokomotivenwerke eine Artiellerieausführung des BT-7. Der neue elliptische Turm war mit dem 76,2-mm-Geschütz CT-28 ausgestattet. Das Fahrzeug erhielt auch neue Funkgeräte. Es wurden insgesamt 155 Artillerie-BT-7 gebaut. Das Fahrzeug wurde bei der karelischen Landenge, in der Mandschurei und in der Anfangsphase des Deutsch-Sowjetischen Kriegs eingesetzt. This tank was given out as a Gift Tank to anyone logging into the game between August 12-19 2015 for NA or August 12-17 for ASIA and EU as part of Wargaming's 5th World of Tanks anniversary celebration. The BT-7 art. is much like the BT-7. Although not as fast, it more than makes up for this with its 76mm howitzer. It is capable of one-shotting most tier II tanks, devastating tier III tanks, and can still damage tier IV and V tanks when using HE. It can use AP rounds but HE has better penetration and damage values. With poor view range and poor hull traverse when going full speed, it isn't very good at active or passive scouting. But the BT-7 art. can derp ambush enemy tanks like the T67, and the rate of fire isn't very bad. Amazing acceleration with 37.04 hp/t;agile. While the BT-7A has good speed, it has very thin armor. Only the Pz. I C can bounce on it(with little angling), but on other hand, this tank has good alpha and reload time for a howitzer. The elevation is good but the depression makes aiming at low-height vehicles like the Hetzer more difficult in close-quarter combat, which due to the Howitzer's accuracy is essential. Knowing your enemies in tier IV and V matches is useful since the potential damage of the howitzer starts varying significantly between vehicles in these tiers - for instance it can easily destroy an Alecto but struggles against the heavily-armoured Matilda. It plays best as flanker, possibly with guerrilla (pop out, shoot at tank rears then take cover) tactics, or as a SPG hunter later on in the battle. During flanking, exposure to the enemy can be minimized by peeping out via the front of the tank. This vehicle follows a similar playstyle for many of the other vehicles with howitzers in different nations (E.g. British and German tank destroyers) - generally thin armor, decreased rate of fire and high-damage gun to similar-tier vehicles. In parallel with the main modification, 154 BT-7A artillery tanks were produced between 1936 and 1938. These were fitted with a larger turret and a 76 mm KT-type gun with 50 rounds of ammunition (40 in a tank with a portable radio). In 1938, four experimental BT-8 tanks mounted with V-2 diesel engines were produced. 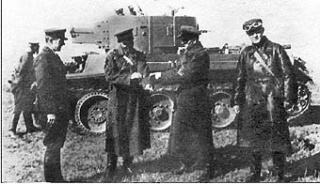 After comparative tests of the BT-7 and BT-8, the diesel tanks were put into production in 1940 (under the designation BT-7M) with the power plants being produced in a separate plant of the Voroshilovets factory to ensure supply. From December 1939, the BT-7A went into production with some minor modifications - additional bracing for rigidity, a floor hatch, and a smaller air filter. The diesel tanks were more fuel efficient, and the petrol-powered tanks were soon placed into reserve. Diese Seite wurde zuletzt am 25. Oktober 2016 um 14:13 Uhr geändert.